Looks like you have a really nice lineup there. I'd love to see more pics. You're absolutely right, too. "While everyone may have a [Shinki], nobody has the same [Shinki]." I find that it's the stories surrounding their lives are the most interesting aspects that us owners share with each other. ...Well, I'll stop here before I sound like a crazy cat lady (Hahaha). And, by Konami, that's the cutest looking Mary I've seen today. Zenislez wrote: Oh nice pics. And glad a new shinki lover join the club. Thanks for the warm welcome! ^_^ Hopefully today I can get a chance to check out your thread. I would love to see the stuff you create! 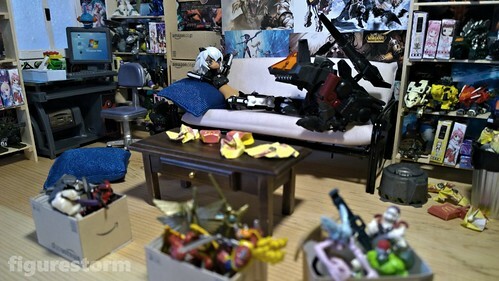 That's probably the other thing that I love about Shinki collectors, is that they are all really creative and come up with some of the neatest stuff! I think wallet-busting is putting it lightly, lol. Right now my top "want" list is Altene, and of course she's gotta be one of the most expensive ones! ARGH. Oh well, save save save! Although I've been hearing that the prices have been coming down on some of them a bit. So maaaaybe by the time I can afford her the price will have dropped! And thank you! I can't really imagine her doing anything but being cute, lol. Also, I finally got to take some detailed pictures of Gabrine's room. 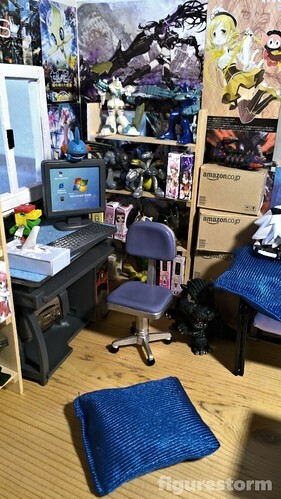 First off I would like to list off some of the sources for her room. The Amazon Boxes are just this Danbo Papercraft that I took and modified a bit. I added a bottom flap to it and I also just took off the Danbo face. You really wouldn't even have to do any of those modifications if you didn't want to, because you could just turn the face around, no problem. Second is the figure boxes! Kixkillradio is a HUGE inspiration for me with pictures and dioramas! Her work is absolutely amazing, and not only is it amazing she's soooo willing to help other creators by offering tutorials and links to download some of her creations! 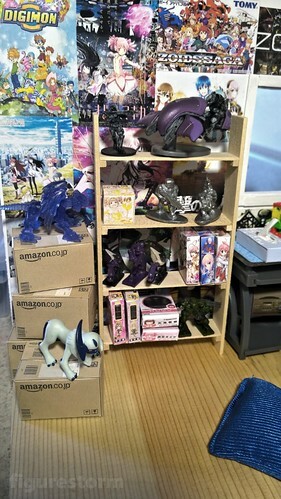 Here is the photoshoot she did which required the figure boxes. And with that she offered a download of all the boxes that she made HERE. The template is easy to use. I don't even know anything about papercrafting and I was able to put them together. Ava AKA Aerohail (I'm not sure what you like to go by on this forum x_x) was a huuuuge help by offering advice on how to set up the walls! They're just foam board that I nailed onto a big piece of wood. I'm honestly not even sure of the dimensions, lol. It was just a piece of wood I found out in the garage that looked like it would work. All the furniture I got HERE. There are also a lot of other dollhouse websites that have decent prices, you just have to shop around a bit. There's at least 5 major miniature websites, so just make sure you do some looking. 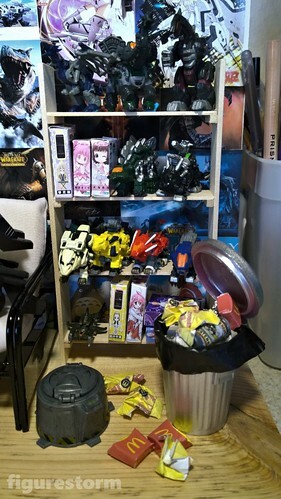 And all the figures in her collection are just things that we found. Micromachines has some awesome lines like Power Rangers and such. All this sort of stuff you can just find on Ebay. We were fortunate that my brother in law had a big collection that we were able to buy off of him. Thanks for the links, amazing stuff. It's even more amazing when seen all at once! You guys have done such a wonderful job! I'm happy the foam board worked out for you! Also, ohnoes at her pet eating from the bin! I don't suppose a spray bottle would be a good idea. XD Who knows, she may end up with some responsibility now she has a pet. oOnyaOo wrote: It's even more amazing when seen all at once! You guys have done such a wonderful job! I'm happy the foam board worked out for you! Haha, she can barely handle the little Command Wolf, and to think I want to get her a full sized one x) And I can just imagine spraying him with a water bottle... I might just have to do a photo set of that! 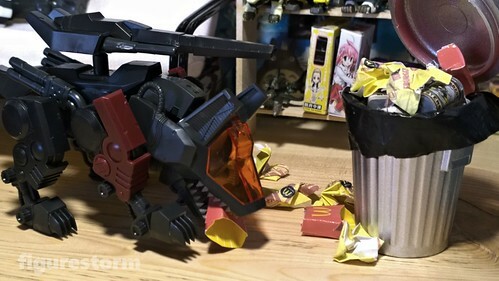 Water bottle vs. Command Wolf's gun, lol. HAHA yeah she's just hanging out in a little Easter basket... >_> The closest thing I did for an "easter shoot" haha. 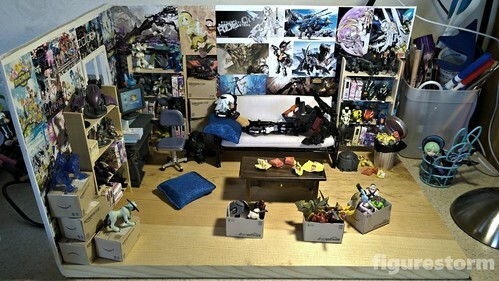 Those are some TINY little Zoids on the shelves.